Add a splash of colour! Apex DIY decorative window films are available in a wide range of colorful patterns and frosts for those that seek something more than a simple frost. Find the color that best suits your residential or commercial decor. Colors are photographed to produce the most accurate representation of our films colors, but may appear somewhat different in various browsers. Lighting where the film is installed will also effect the hue. If you are unsure about the color, please contact us for a free sample, click this link to request a sample. Also in this category are Apex faux stained glass window films, click this link to view our stained glass category alone. Please Choose a Sub-Category of Colour Films below or scroll down to see our entire collection. 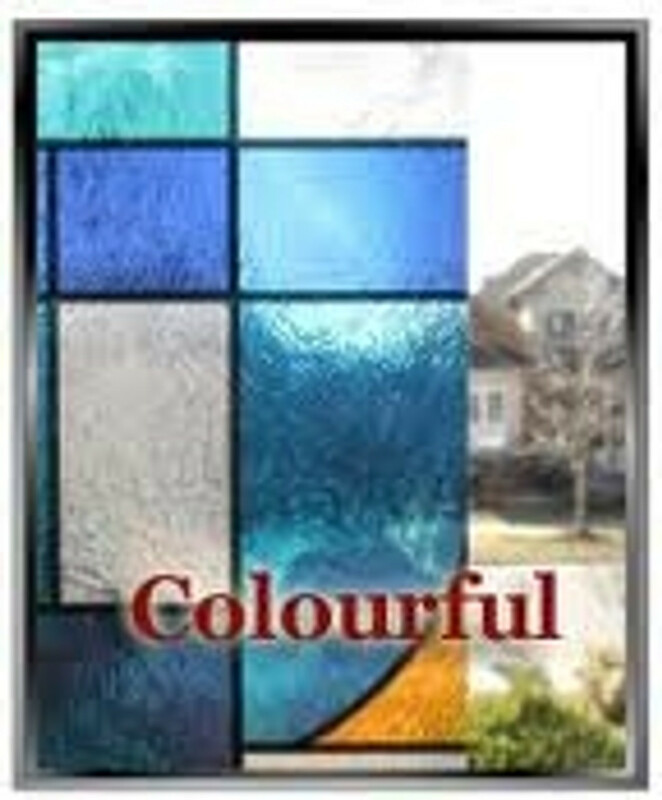 Available Width 36" Look of stained glass windows in a colourful abstract pattern. Textured film offering excellent privacy. Available Width 36" Achieve the look of stained glass windows; This colourful film includes peaceful doves. in a colourful abstract pattern. A textured film offering excellent privacy. Available Width 36" Achieve the look of stained glass windows; This colourful film incorporates swimming fish. A textured film offering excellent privacy. Available Width 48" Neutral matte frost film in a natural 'cocoa' tone. An good privacy film allowing light transmission. A warmer alternative to classic frosts. Available Width 36" Pretty colourful flowers in a matte background. Provides terrific privacy with a splash of colour. Available Widths: 50" Geometric pattern window film prismatically refracts light or 'rainbows'. Squares in this pattern are 1.25". Very interesting and modern looking film, offers excellent privacy. Available Width 36" Excellent privacy film; Blue film with pretty, delicate blue flowers. The perfect finishing touch!